« The Cape May Bunker is no longer out in the ocean! I grew up across the road and up the hill from the Pumpkin House and knew the wonderful pumpkins who lived there. Many a summer’s day was spent cooling off in the pool. As a child I found it to be a fascinating place and I just knew if I searched hard enough, a fairy would surely appear. I’m interested in the pumpkin house in sussex county. It is near Culver’s Lake. I read an article from 2000 that said it was to be torn down because it was too extravagant for a pumpkin and squash farmhouse. Do you have any info? I like your site. I’m familiar with the Blairstown radio station. My friends and I have been in it and explored. It is not haunted or remotely scary or weird. However, the old railroad station right next to it has some haunting vibes. Unbelievable. 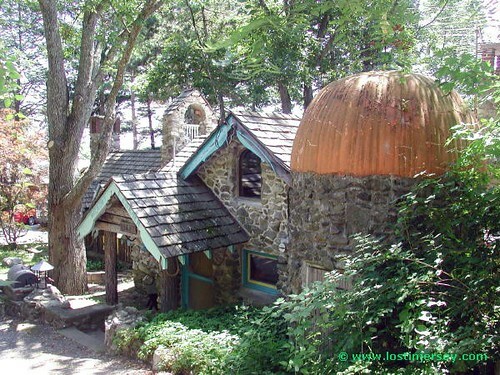 I grew up right across from the “Pumpkin House” pictured on your “Unusual Houses” page. In fact, our school bus would stop right in front of this house. If you’re interested, there also was a house about a mile or so east of here on the opposite side of the street that used to be known as “Hodgepodge Lodge” which had multicolored roof tiles which was equally unique. I believe this is on the north shore of Culvers Lake, New Jersey. I have been here before because I had a boyfriend once whose uncle owned this property. That was over 10 years ago though. I could be totally wrong. Can I get a address for this?! The Pumpkin House will soon be up for sale ($275K). Contact me for info. Where is Pink Austin Bellamy today 10/2009? He is an Uncle in which I never met much like the rest of my father’s side of the family nor did my father talk much about it. He told me when I was around 7 or 8 that he had a brother named Austin living in Perth Amboy NJ. He set out several times to find him when we lived in Pennsylvania but he could never find him. We are now residing in Charlotte NC and this is the second time we are reading about Uncle Austin. My father was also very good with his hands just like Austin and they both loved that blue.In your previous article you had a photo of him and he looked just like my father with that thick mustache and Indian like hair. I really don’t think he is back down here in the south so if anyone knows where he is let him know that his brother Carnell’s wife and kids are now living in Charlotte and that Carnell passed away 8 years ago and his nieces and nephews would really love to meet him. sorry but I honestly have no idea where he is. Last I heard (when his house and the whole shanty town were torn down) word was he was moving to Florida. But that was just a rumor, I never actually met him.